“There is an evident purpose to malign and create false impressions that a person here is insecure in life, and that the citizens of Dodge City are walking howitzers. This is a bad impression that should by all means be corrected. 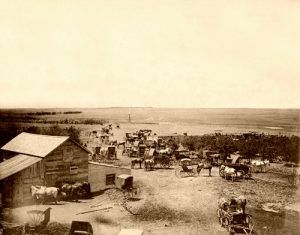 Having but a short residence in this town, it is our deliberate opinion, from a careful observation, that Dodge City is as quiet and orderly as any town of its size in Kansas. We have been treated with the utmost cordiality. We have observed officers prompt and efficient in the discharge of their duties. There is an ordinance prohibiting the carrying of firearms, which is rigidly enforced. The citizens are cordial, industrious, and display a business alacrity characteristic of the frontier tradesman. We are surprised to note the difference of character of this town and the impression aimed to be made upon us before coming here. There is a lurking jealousy somewhere, that gives rise to false rumors, and we trust every citizen of Dodge City will correct these false impressions as far as lies in his power. “At ten o’clock last night. 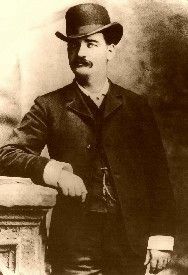 City Marshal Edward Masterson, discovered that a cowboy who was working for Obum of Kansas City, named Jack Wagner, was carrying a six-shooter contrary to the City Ordinance. Wagner was at the time under the influence of liquor, but quietly gave up the pistol. The Marshal gave it to some of Wagner’s friends for safe keeping and stepped out into the street. No sooner had he done so than Wagner ran out after him pulling another pistol, which the Marshal had not observed. The Marshal saw him coming and turned upon Wagner and grabbed hold of him. Wagner shot Marshal Masterson at once through the abdomen, being so close to him that the discharge set the Marshal’s clothes on fire. Marshal Masterson then shot Wagner. Marshal Masterson walked across the street to George M. Hoover’s saloon, where after telling that he was shot, he sank to the floor. He was immediately removed to his room, where in half an hour he expired. The city is in mourning; every door is draped with crape; business is entirely suspended till after the funeral of Marshal Masterson, which will take place at two o’clock p. m., and will be attended by everybody in the city.